Spaceship Earth from the Official Epcot Site. Starting this last weekend, a Facebook group known as Weekly Walt Disney World had its first meeting in honor of Epcot's upcoming 30th anniversary. The goal is to experience all attractions and events the park features by the time of the anniversary, focusing on one a week. A noble goal, but I think my bar bill from World Showcase might send Nicole and I into poverty by the time the year's over. There's also a foolhardy attempt to consume one of the world's worst beverages every week, the shockingly bitter Beverly. I have dedicated myself to this endeavor because I have some bizarre tolerance for torture. It's a Small World doesn't phase me, and some infamous Italian soda isn't going to either. Anyway, I've decided to give my thoughts and commentary on each attraction every week, whether I've attended or not. I say “or not” out of fear of the aforementioned allure of alcohol from around the world. This week's main event was Test Track, a ride only slightly less thrilling than our random spotting of David Copperfield searching the park for pizza. Apparently he's unable to make mediocre snack stand food appear out of thin air, but he may achieve the legendary trick of eating it without indigestion. 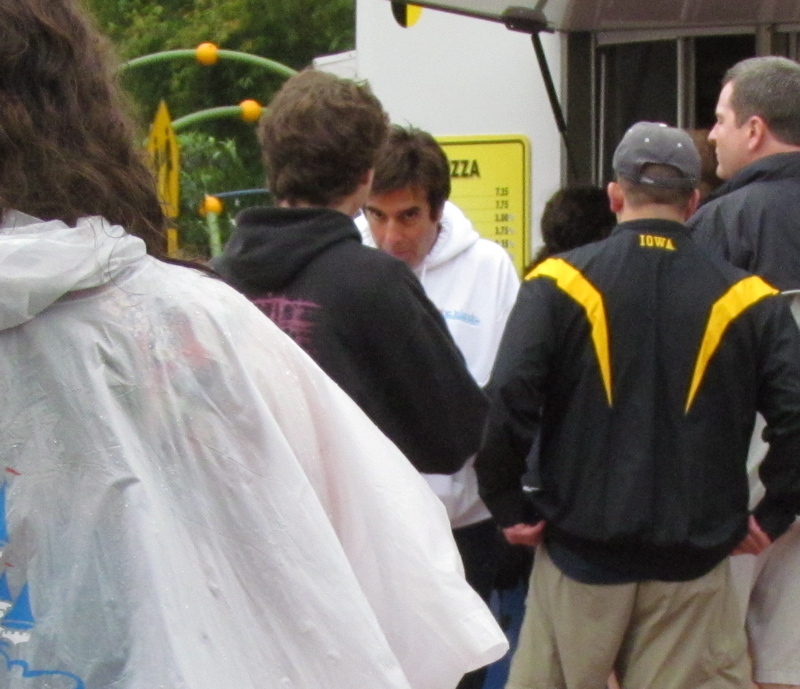 David Copperfield at Epcot, photo from Denise at Mousesteps' Twitter. Of course this was the day my cameras weren't working. The ride replaced World of Motion, a dark ride about mankind's development of transportation. While Test Track is a great ride, the loss of World of Motion is bemoaned as one of the first blows to Epcot's edutainment focus. This may be because that ride was about showing our shared technological growth, while the important lesson of Test Track is “Buy GM, or we'll ram your test vehicle into a wall.” I sadly was never able to experience World of Motion, so I guess I can't judge too much. Test Track photo also from Disney World's Official Epcot site. all of my Disney photos were lost a while ago in a hard drive crash. Test Track was scheduled to open in early 1997, but took over an extra year to open due to the ride system's unreliability. Even after opening at the end of 1998, the ride still managed to break down at the slightest disturbance. I believe the flatulence of passing egrets could shut down the entire ride at one point. As the years went by the ride system became more reliable, and was even used for Tokyo Disney Sea's Journey to the Center of the Earth and the upcoming Radiator Spring's Racers. Today, Test Track remains a marquee ride at Epcot. The “test vehicles” navigate a indoor course that includes bumpy roads, steep ascents, tight turns, and even the Dark Ride classic of blaring a loud noise in the dark to give this rider a heart attack. It's a fun sensory experience with decent industrial theming, but the true rush is the 65 mph run on an outside oval track with the air rushing past. Although I still get bigger scares on the I-4 driving to Epcot, the end result is a nice shot of adrenaline and a head full of displaced hair. Test Track is set to go down for some new theming for a good portion of the year. This would be exciting, except that it seems to be giving the ride an exciting Chevrolet overlay. Unless they give out unlimited fast passes to Chevy owners, namely me, I don't foresee this changing much of the experience. However, unless they also hire some used car salesmen to staff the showroom at the end, I'm not going to complain much.